Esther Muiruri is an Associate Director in charge of Agribusiness at Equity Bank. Muiruri also serves as a Director in the Board of Equity Insurance Agency a Subsidiary of Equity Group. She graduated with a degree in Business Administration and a master's degree in Strategic Management from the University of Nairobi. Before joining Equity Bank, Muiruri worked with Government of Kenya in various positions managing agriculture projects working with farmers and other stakeholders in the wider agriculture sector in Kenya. Muiruri established the agribusiness department and introduced financing of agriculture value chains through strategic partnerships with players in the agriculture sector. 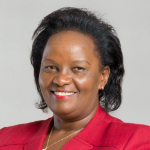 She has served as a member of most agricultural stakeholders’ forums in Kenya with objective of making smallholder agriculture commercially sustainable and internationally competitive.